This amazing tour, truly gives gives you a 360° tour of Loch Ness. 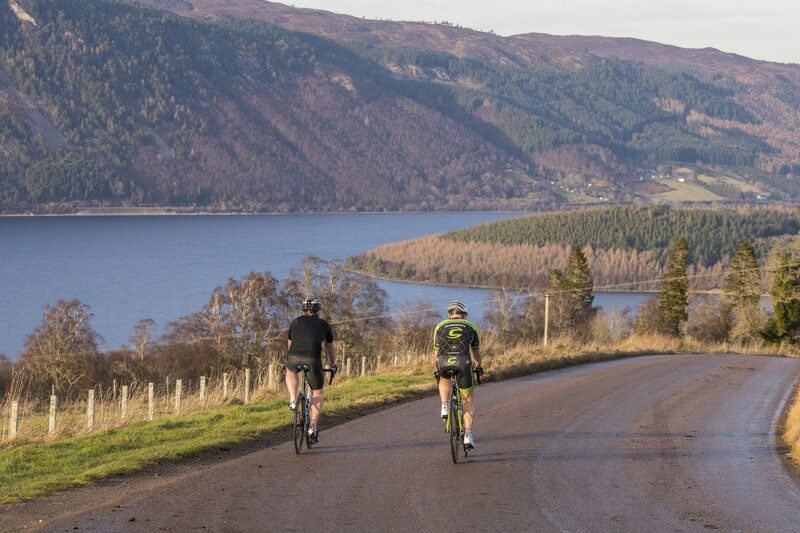 The route leaves Inverness, on open roads, and follows the A82 west to Fort Augustus, passing through the villages of Drumnadrochit and Invermoriston. En route you will pass by areas of significant historical interest such as Urquhart Castle. When in Fort Augustus, the route then crosses the Caledonian Canal, where you will start your return journey back to Inverness via South Loch Ness on the B862/B852. Not before however you are facing Scotland's own Monte Zoncolan - Glen Doe. Glen Doe Summit is a 4.8 mile (9km ) climb, gaining 380m in height. Immediately upon leaving Fort Augustus, you start your excruciating assent up Glen Doe, leaving Fort Augstus in your shadow, climbing a 12% gradient. Once you have conquered the Glen Doe summit, the views open up at Suidhe Viewpoint with panoramic views swooping down into the glens above Loch Ness. Back on the bike, our tour takes you back onto the undulating B862 through Whitebridge, Foyers (Falls of Foyers), Invermoriston and Dores before before arriving back in Inverness. This trip truly could not be more Scottish, and incorporates everything you would expect from a trip in the Highlands - Loch Ness, glens, mountains, 2 castles and the infamous Boleskine House (previously owned by Jimmy Page). The only thing we leave to chance is your choice of dram.........and of course Nessie making an appearance!!!! !